We are heartbroken to pass along the news that sweet, handsome, little Gemini passed away about 10 am this morning in Rob's and my arms. He had gotten sick a few days ago and despite round the clock monitoring and vet care we were unable to save him. The blood work showed that he had almost no white blood cells which, as the vet explained to us, indicated an infection,likely viral, that he was unable to fight off. This special little guy was deeply loved and will be greatly missed by us. He left us way too soon. Hi! 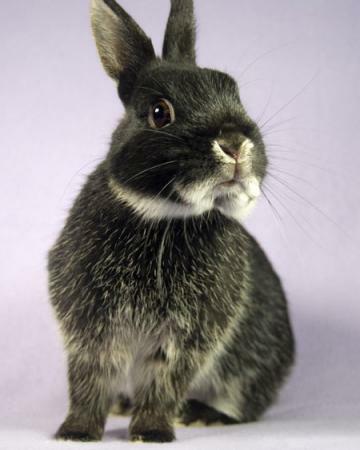 My name is Gemini and I am an incredibly cute, neutered,tiny Netherland dwarf boy. I love to run and bounce and explore! So many new things to see and places to go. I don't like to stay still for long. I'm a great choice for people who like a busy bunny with a full day's agenda packed into every moment. I prefer to be moving instead of being held for long periods. So, all you bunny holders and snugglers, you might want to adopt a calmer, bigger bunny rather than me. I'm fun to watch and pet when I feel like it, but I am just too busy to stay still in your arms or lap for long.